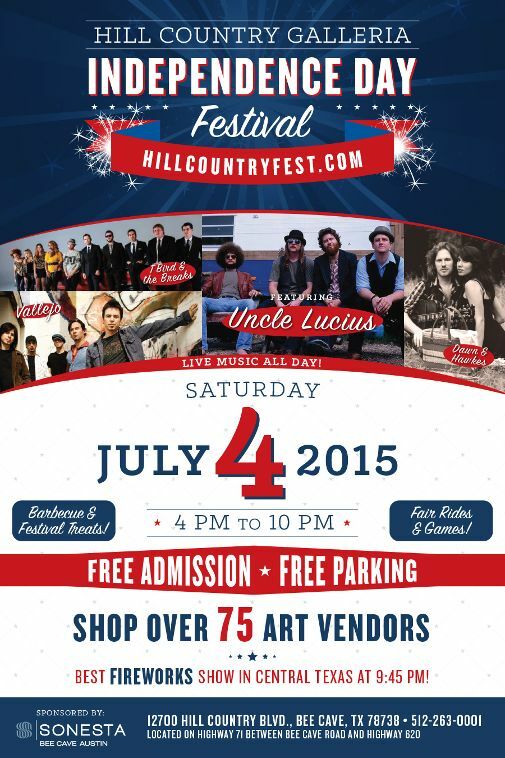 The Hill Country Galleria is throwing a huge bash to celebrate America's Independence! This FREE celebration will have over 75 local art vendors, live music, barbecue, festival food, rides & games, and of course fireworks! 9:45 P.M. Firework Show with Grand Finale! Iced Coffee from Bee Cave Coffee Co.
Parents: Be sure to get there early to enjoy the fair rides and games & family fun entertainment. The Red, White & Zoo petting zoo will return for the kids to enjoy! ...bring your swimsuit for the water rides! ...win cool prizes when you play! Art vendors will be set up along the streets of the Galleria for you to browse and shop. Jewelry, clothing, artwork, and other handmade items will be available for purchase. Additionally, the Hill Country Galleria is home to over 100 shops and restaurants for you to explore and enjoy while you are here. A special thanks to our title sponsor, SONESTA Bee Cave Hotel -- officially opening their doors on July 5th!